The Marche in central Italy is where the Verdicchio grape shows that it’s one of Italy’s finest native white grapes. As well as making highly distinctive and characterful wines, it’s also versatile. It makes a range of wine styles; from fizz through to sweet wines. However, the best examples are the dry still white wines that can have outstanding longevity. Verdicchio here comes from the famous Verdicchio dei Castelli di Jesi and its neighbour, Verdicchio di Matelica. The name Verdicchio means “little green one,” after the distinctive green tinge of the grapes; a colour the grapes retain even when fully ripe. DNA tests show that Verdicchio is the same as the Trebbiano di Soave of the Veneto. It probably arrived in the Marche with farmers coming from the Veneto during the late middle ages. They settled in the Marche after calamitous plagues devastated this part of Italy. Both Jesi and Matelica are DOC’s, with their Riserva wines gaining a higher DOCG status in 2010. Jesi celebrates the 50th anniversary of its DOC this year. Matelica obtained it’s DOC one year earlier, in 1967. The laws for both of them stipulate that Verdicchio must make up at least 85% of the content. However, most are 100% varietal wines. While the towns of Jesi and Matelica are only some 30 miles apart, their terroirs are distinct. The wine region on the hills around Jesi is near to the Adriatic coast and the city of Ancona. There, cooling breezes blow from the Adriatic up several east-west river valleys. In contrast, Matelica is further inland and has a unique north-south orientation, where mountains block any seaborne ventilation. Vineyards in this single landlocked valley consequently enjoy a distinctively continental climate. That means warmer summers and colder winters. There’s more day-night temperature variation too, so extending the growing season and aiding wine aromatics and acidity. Harvests here are often in late October. Hence in general, the Matelica wines tend to higher acidity, yet with more body than many of their Jesi counterparts. Neither area is necessarily better than the other. Instead, they are different. Viva la differenza! Matelica is a tiny area, only one-tenth the size of Jesi, with just 325 hectares of Verdicchio. Its vineyards are at an altitude of 400 metres upwards, on the limestone and clay slopes of the valley sides. From there, it’s possible to see the entire DOC laid out below, a vista of unspoiled nature. The vineyards, forest and fields make for an unexpectedly lush patchwork. There are fifty shades of green in the early summer landscape that pleases the eye. A Verdicchio di Matelica tasting revealed as many shades in the glass too. What better way to explore the Verdicchio d Matelica wines than with a tasting featuring twelve of its leading producers? They brought 22 different Matelica wines from their DOC and Riserva DOCG. These also ranged in age, from 2017 going back to 2007. 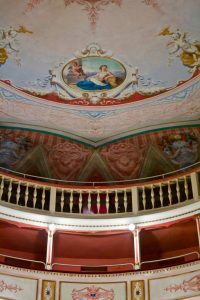 The venue for this was the Teatro Piermarini in Matelica, co-hosted by winemaker Roberto Potentini of Cantine Belisario and Conductor and Pianist Cinzia Pennesi. The theatre dates from 1805. It was designed by Giuseppe Piermarini, who also created Milan’s world-famous Scala opera house. Built on the site of Matelica’s Roman baths, it’s a glamorous setting to showcase Matelica wines. Here’s a two-minute video of the theatre, resplendent in white and gold. This tasting revealed that Verdicchio is as elegant and sophisticated as its surroundings. The younger wines are fresh and vivacious, often with delicate scents of Hawthorn flowers and almonds. These have leesy flavours, a pronounced saline minerality and a distinctive kick on the finish. After a year or two, they begin to show further complexity. At between five to ten years old they are arguably at their peak. Even then, the best will have many more years ahead. Now, camphor-like scents mingle with almonds on the nose. On the palate, acacia, green fruits and a honeyed complexity develop. With a satin-sheets texture, there is always a refreshing bite at the finish. 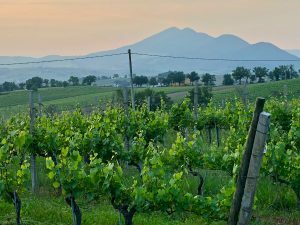 These wines are also great food partners, as you might expect, and the Marche is where northern and southern Italian cuisines collide. Verdicchio, whether from Jesi or Matelica, has a natural affinity with the sea, so fish is a great match, including Ancona’s traditional stoccafisso. As an aperitivo, a plate of deep-fried stuffed Ascolana olives (ascolane all’ascolana), and a glass or two of young Verdicchio is a more-ish regional treat. However, the Marche is a Truffle hotspot and its flavours pair well too. Alternatively, a Marche speciality called Vincisgrassi hits the spot. It’s a creamily rich version of Lasagne, using chicken livers and offal. 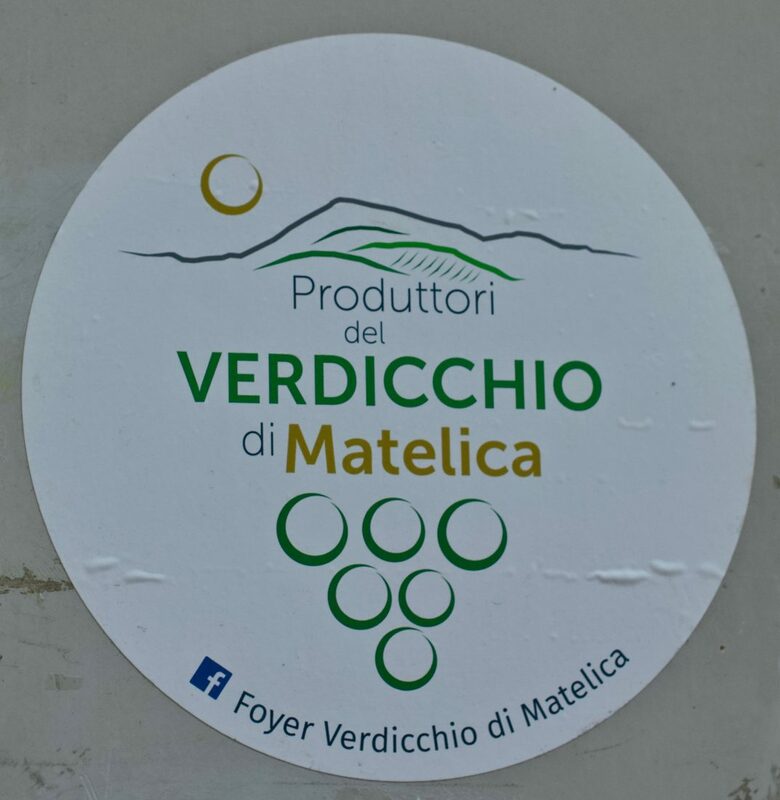 Here are three recommended examples of Verdicchio di Matelica that are available in the UK. I’d always advise buying two bottles at least; one to drink now and another one to put away and return to in a few years! Fattoria La Monacesca, “Mirum” Riserva DOCG, 2015. Cadman Fine Wines, £20.99; Italvinus £20.86 This no-sulphur flagship wine is one of my top ten Italian whites. Older vintages will give any Grand Cru Burgundy a run for its money. Cantine Belisario, “Terre di Valbona” DOC, 2016 Valvona and Crolla £9.99. A terrific introduction to Matelica from this local high quality co-operative. Delightful younger drinking. Cantine Colpaola, DOC, 2016 Tannico £13.42. Carefully handcrafted wine from this small organic estate. The companion piece (part 2) on Verdicchio dei Castelli di Jesi can be found here.